KAMPALA – Mr David Omoding, a secondary school teacher of Art and design, was appointed to supervise the national Primary Leaving Examinations (PLE) in Sironko district in 2014. When he reached the school early in the morning, he found the head teacher and teachers in a meeting but he straight away headed for the examination room. Mr Omoding says that when he reached the examination room, he found candidates conversing outside as the examination room remained closed. “I headed for the office of the headmaster and before I could ask him, he asked me to calm down. He introduced to his teachers, invigilators and handed me Shs 300,000 to help the pupils,” said Mr Omoding. He said although he declined to take the money when he reached the examination room, he discovered that a number of pictures on the desks not corresponding with the candidates meant to sit for the examinations. Mr. Omoding is not alone, several supervisors have been used in malpractices in national examinations across the country, unfortunately, these walk free without anybody raising a finger at them including UNEB, the national examination managers. Reports from police stations across the country indicate that cheating in national examinations has become a common occurrence to the level of even parents hire other people to sit examinations for their children to get good grades even at nursery schools. Mr Fred Muwema, a renowned city lawyer and director legal & corporate affairs Anti-Counterfeit Network Africa says from primary schools way up to the higher learning institutions malpractices have become a normal occurrence where nobody bothers about it. “Our quality of education is being compromised by the malpractices. It is a shame to know that our institutions of higher learning, parents, teachers and big people in high offices are at the forefront of these malpractices,” added Mr Muwema while appearing a local TV on counterfeits. Mr Muwema explained that many Ugandans are content to remain mute when they suffer the damaging effects of examination malpractice each and every year. The Uganda National Examinations Board [Uneb] 2017 UCE exams faced a challenge of leaked exams before the final papers were administered, causing panic in the board and copies of the leaked exam papers, including for Biology, Chemistry and CRE were then widely published on social media platform, with some students accessing them in advance. And just at the release of the Uganda Certificate of Education last year, UNEB withheld examination results of at least 1,886 candidates, while at the release of the 2016 Uganda Advanced Certificate Examination results withheld the results of 64 candidates from 11 examination centers across the country. Mr Omoding explained that the national examinations for senior four are about to end while Primary leaving examinations and Uganda advanced certificate of Education begin in November, UNEB should keep its head high to ensure that nobody cheats or leaks examinations. “We don’t need fake papers or forged papers, we don’t need people who cheat in examinations because they will not measure to the quality of the labour force our country desires, UNEB should ensure that national examinations produce the best labour force for the country,” said Mr Omoding. The UNEB executive secretary Mr Daniel Odong said the results were withheld over examination malpractices that involved form of external assistance, collusion among candidates and smuggling of unauthorized material into the examination room. Prof Okwakol said Malpractices introduce inequities into the examination system and that in other examinations; the level of malpractice is so high that it seriously undermines the credibility of the examination system. Mr Dong named the following as the common malpractices across the country; leakage, impersonation, external assistance especially in science practicals and Art, smuggling of foreign materials and copying, collusion. Mr Kibale Wambi, a former Education officer and politician says that as long as the Education system in Uganda remains examination oriented, examination malpractices will continue. He explained that examination malpractices start in UNEB where the examiners sneak out what they have set and begin coaching some schools on how to approach and pass in return for good money when the results come out. “The examiners at UNEB who are the teachers in some of these schools, how do you expect them not to reveal what they have set? Then it goes to parents who want their children to get good grades, then the head teachers who want their schools to shine,” said Mr Kibale. Mr Michael Ssemugabi, a secondary school teacher in Kampala claims that it is private schools in the country that engage in examination malpractices because getting good results is a way of advertising their schools to potential students. “And private school involve in malpractices because they are set up as business ventures seeking to make more money so the schools are ready to cheat and achieve success at all costs that is why it is difficult to fight the vice,” said Mr Ssemugabi. Mr Daudi Mulongo, the former head teacher of Kiira College Butiki says one of the factors contributing to examination malpractice is that many of students are craving for paper qualifications without the willingness to acquire relevant knowledge and skills. “The examination malpractice is also traceable to the teachers because they don’t teach effectively in order to allow students to think on their own to pass an examination without cheating,” said Mr Mulongo. He explained that laziness and inadequate preparation on the side of the students for the examination, also contribute to the malpractice. “He who fails to prepare prepares to fail”, and since many who failed in preparation are bent on passing at all costs; cheating becomes their only option, this is true. People need to have good values so that they can pass genuinely,” added Mr Mulongo. Mr. Mulongo explained further that some parents pay for mercenaries to write examinations on behalf of their children and that some go to bribe teachers or buy examination papers for their children to pass. Mr Prosper Lwamasaka, the deputy director of education at KCCA says corruption has been institutionalized in Uganda and that examination malpractice is just one of the corrupt practices and that its increase is due to competition amongst schools for high grades. Mr Lwamasaka says many officials at UNEB have also joined fraudulent teachers and sometimes school administrators not only to allow cheating in examinations but to get money. Mr Muwema says that some of the internal and external invigilators are bought over with money, material gifts and that this coupled with poor examination facilities, the poor conduct of examination, the inadequate spacing of students in examination halls, slack supervision of examination, inefficient invigilation contribute to malpractices at the national examinations. He revealed that our casual conduct of omitting to vigorously rise up to these examination malpractices means we are conspirators to the crime or in the least, we are knowingly or unknowingly condoning it. It is such malaise that is quickly christening Uganda as a country of fake products and services. “UNEB needs to stand up against this, reprimand and sanction for examination malpractice. The ruling party Electoral Commission unearthed 55 fake documents presented by its aspirants who are the level of parents, what did UNEB do about this? The children who saw this, what do you expect them to do in future?, we need to teach our children against this form of corruption, we need to arrest those involved in order to set out society on the right course for our children, we must also condemn it as leaders,” said Mr Muwema. He added that the stoic endurance of examination malpractice by schools and parents does not stand them in good-stead either .many of them are direct or indirect conspirators in this scam though none will admit it on any day. Ms Sumba Betty, a teacher of literature and English says that the lax and nonchalant attitude of UNEB is killing the heart and soul of the country slowly but surely. “It is clear that the purpose of examinations is to test the competency and level of understanding of students in a particular field but what examination malpractices are doing completely defeats this purpose by producing certificated but illiterate students who are purveyors of degrees and certificates they cannot defend,” said Ms Sumba, who is also a Don at Islamic University in Uganda. What is UNEB doing to fight malpractice? The UNEB executive secretary Mr Daniel Odong says UNEB works with Police officers across the country to fight the malpractices. “And to that effect, a number of people involved in malpractices have been arrested,” said Mr Odong. He explained that UNEB held a conference on malpractices that characterize national examinations and that he presented a paper on how to end the malpractices like increasing the number of invigilators, supervisors and their remuneration in August 2017 at Resort Munyonyo Hotel. He said they have tried to bring down the malpractices from the time they took office and that setting up rules for each centre to have big examination halls, large classrooms, adequate seats and adequate number of invigilators. Another UNEB official who asked for anonymity because he is not authorized to speak for UNEB explained that UNEB also thinks that continuous assessment to reduce examination malpractices is key to ending examination malpractices. But Mr Muwema adds that investigations into and prosecution action against culprits must be more visible and effective and these should replace the empty threats which populate most of the UNEB media releases. In a latest Twaweza’s Sauti za Wananchi report four out ten Ugandans want schools that cheat in examinations to be closed down completely. The report, released in Kampala October 8 indicates that two out of ten [20%] of the Ugandans also want individuals involved in the examination cheating to be arrested and punished. The report entitled; Preparing the next generation, Uganda’s experiences and opinions on Education a product of Twaweza’s; new Sauti za Wananchi survey says that for schools that perform badly in national examinations, the head teachers should be transferred. What Kenya is doing about the malpractice? In Kenya apart from photographs, fingerprints are used for identification as no two persons; even identical twins could have the same fingerprint. The government has been tasked to play a very big role in curbing this menace by providing enough classrooms, desks and employing enough invigilators. The government also passed the KNEC Act 2012 which provides for better management of national examinations with stiffer penalties for perpetrators of such malpractices. 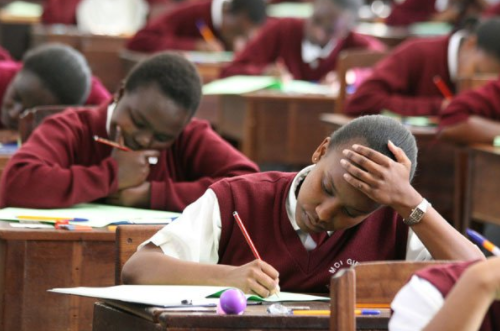 According to KNEC once the rules are gazetted any person involved in examinations malpractice faces a risk of a five-year jail term or Sh2 million in fines or both and that candidates found cheating will also be bared for up to three years from seating for any KNEC Examination. Although Kenya is doing all this, Uganda has no law about malpractices and therefore those who commit them are just arrested, arraigned before court and released. In Kenya such harsh and punitive punishment has checked the menace of exam malpractice.We need the same treatment in Uganda.